March 31st in Free Plug-ins by Wordpress Jedi . Whether we like it or not, search engines have so much power these days. They can determine who stays in business and who goes out of business with the way they rank blogs and portals. While you can’t know for sure how these engines rank your website, you can take action to give your website the best chance at getting ranked high on Google and other top search engines. That’s where WordPress SEO plugins come in. They let you get more out of your blog and drive more traffic to it for free. Keyword Statistics is another one of those plugins that is written to help you optimize your blog for SEO and increase your chances of success with your website. Keyword Statistics is for those who are familiar with the concept of keyword density and want to strike the right cord with their percentages in each and every post. It keeps tracks of 2 word and 3 word phrases and lets you get a better idea about what keyword phrases you are targeting on your blog. 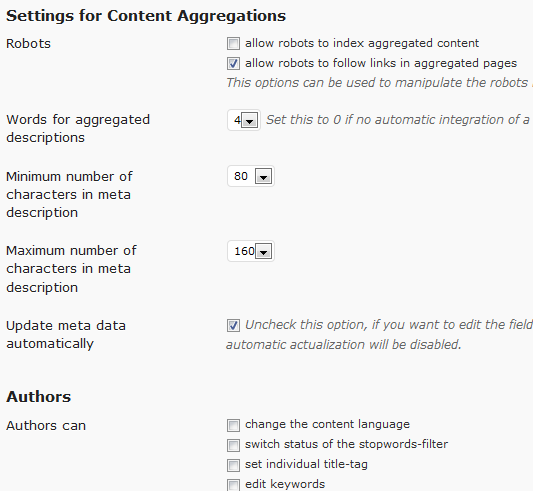 The plugin also gives you option as far as how your content is treated by web-bots. You can also determine what you want or don’t want to be used for ODP or Yahoo! Directory. The automatic generation of keywords-lists and a descriptions for all posts helps as well. You do want to be careful about the automatic features of this plugin. I have no doubt that this plugin is capable of producing what it promises, but I take a hands on approach with on-page factors on my blog. So I rather choose what shows up as description for my posts before displaying it to Google and other search engines. Nevertheless, Keyword Statistics is a nice addition to your SEO plugin collection, if you intend to customize your blog further to increase your search engine rankings.